More than 250 people didn't let Oct. 4's chilly autumn weather stop them from attending a Saturday-morning celebration outside the College of Human Sciences building. 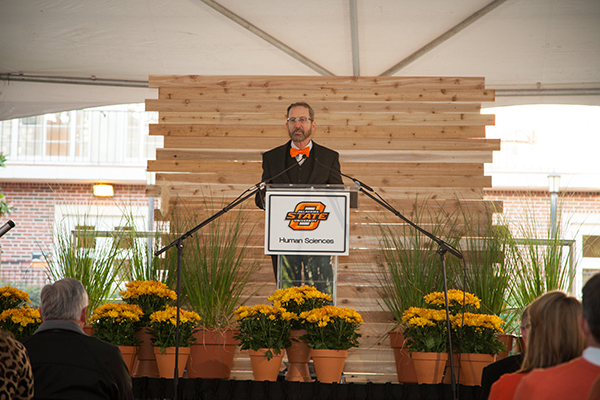 Human Sciences Dean Stephan Wilson led the ceremonial groundbreaking for the addition of a third wing to the facility, which opened in 1951. This 82,000-square-foot expansion will add 27,000 square feet of laboratory space, a 350-seat auditorium, a 5,000-square-foot great hall and a 1,300-square-foot professional partners' suite. "Here we are almost 65 years after construction began on this building, embarking once again on creating spaces that will accommodate students so that they can learn and explore in ways suited to the 21st century," Wilson says. "The donors and campaign committee members we honor today are visionaries who had the foresight to know the value of experiential learning. The technologies and space needed for this type of learning are the foundation for this addition to the current building." This expansion fulfills the vision of Henry Bennett, OSU's legendary president from 1928-1950. Bennett celebrated the 50th anniversary of what was then the Division of Home Economics in 1950 by announcing plans for its new three-wing home. Wilson says that just as that building is being adapted for 21st-century learning, "It will also be adaptable 50 years from now to accommodate different ways of teaching and learning that we cannot yet imagine." Burns Hargis, OSU's current president, also stressed the importance of the expansion, which is estimated to finish by fall 2016. 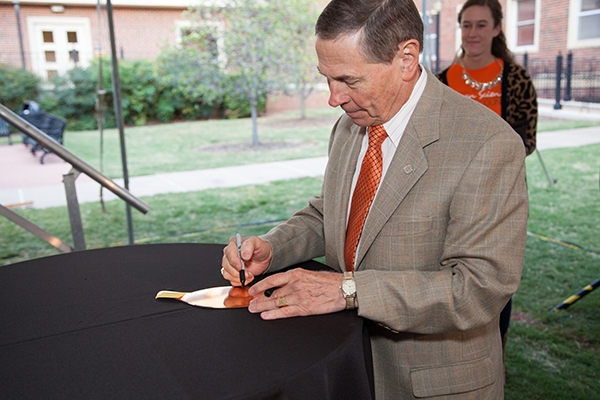 Bryan Close, a donor and co-chair of the campaign committee, signs one of the metal leaves that will become part of a permanent tree sculpture in the new wing. "The truth is that facilities don't transform things — people transform things — but facilities provide the platform for people to transform the world," Hargis says. "That's why it is so important that not only do we have the facilities where our faculty and students operate, but we also demonstrate to the nation and the world that we are committed to being one of the best in the whole country." Among the event's honorees was Bryan Close of Tulsa, a 1966 hotel and restaurant alumnus who was recognized as both a major donor and co-chair of the Human Sciences Campaign Committee. "This new facility should provide the means for the college to appropriately react to anticipated greater demands and expectations," Close says. "The Center for Beverage Education has to be my favorite feature, if for no other reason than its uniqueness to higher education in Oklahoma and its essential contribution to the hospitality programs." Committee co-chair Gerald Roulet of Sand Springs, Okla., was also honored. He says he supports education because it is the only permanent path to social and economic advancement. "I can't think of a better return on a donor's time or treasure than quality education," Roulet says. "The geometric effect of a dollar spent can be as high as 10-to-1, which is unparalleled in most other opportunities. Making a difference in the quality of people's lives has always been a core value for me, and Human Sciences is uniquely positioned to develop students who will advance that value." Jim Hopper, president of the Oklahoma Restaurant Association, was honored as a committee member and a representative of the Oklahoma Hospitality Foundation. The OHF has made a gift to name the Center for Beverage Education after a longtime member of the foundation's board of directors, Wayne Hirst. Hopper says Hirst was a major force behind the increased appreciation for wine in Oklahoma. "He has done so much for the industry, and we felt like this was a really good way to honor his commitment and contributions," Hopper says. "Similarly, this whole facility will be great for the state's hospitality industry because it enhances an already outstanding program. It enhances OSU's ability to bring in and educate great students who will be the future leaders for these companies." DLR Group architect Nathan Miller says the building will display Human Sciences' wide variety of projects and programs. It will also feature high-tech virtual and augmented-reality labs. Dean Stephan Wilson thanked those who made this renovation possible. Natalie Richardson, marriage and family therapy master's student, and Ty McCall, hotel and restaurant administration junior, expressed students' gratitude to the donors. Donors signed metal leaves that will become part of a permanent tree sculpture in the new wing. Human Sciences students also presented personalized cowboy-style construction hats to donors and committee members. "We are looking forward to the addition to our building as the college continues to expand and grow," Wilson says. "With the students in mind, we have ensured the new addition will provide them with the best education possible. Frankly, the list of possibilities for this new, vital space is limited only by the imagination. Now is the time for the College of Human Sciences to build the future." The ceremony aired on OState.TV, where it may still be viewed. More information is available at humansciences.okstate.edu/new-building.